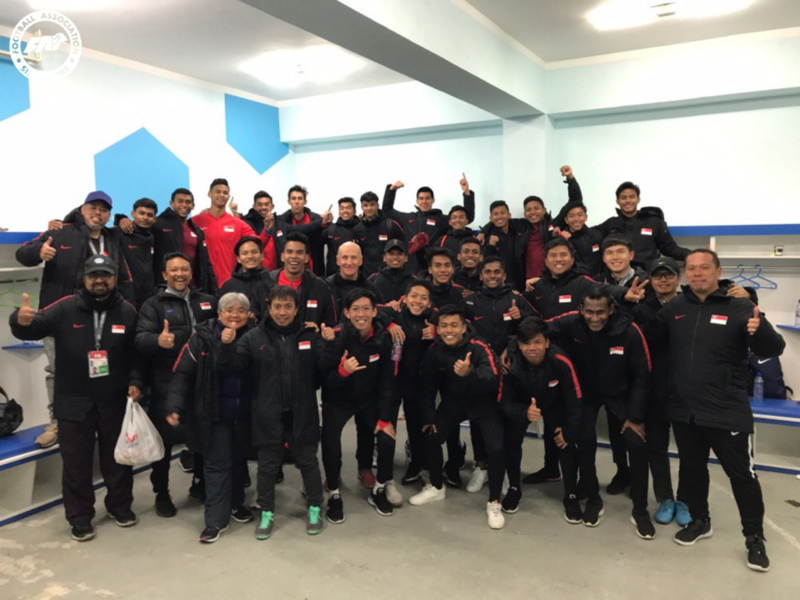 ULAANBAATAR, 27 MARCH 2019 – Singapore Under-22 head coach Fandi Ahmad hailed his side’s spirit and overall performance in the Asian Football Confederation (AFC) U23 Championship qualifiers after they concluded their campaign yesterday evening. A comeback 3-1 victory over hosts Mongolia meant that Singapore finished with five points in Group G, second to DPR Korea, who qualified as group winners. Singapore had drawn 1-1 with both Hong Kong and Korea in their first two games, and Fandi was pleased despite falling just short of qualification. “First and foremost, we are very happy to get the three points,” he said at the post-match press conference. “I want to give credit to Mongolia, who had a run at us in the first half, especially the first 20 minutes… (where) they were on top of us. “We thought we could get an early goal but instead they got it, in the second minute. These Mongolian players are fighters; they never gave up, they fought very hard and I must say they are good players and a hardworking team. Singapore had been attempting to qualify for the AFC U23 Championship for the first time ever and while that failed to materialise, it was still the nation’s best ever showing – in each of the previous three editions of qualifying, there was at least one defeat and the team never finished higher than third. Unsurprisingly, Fandi praised his charges and reflected positively on the journey, which started earlier this month with a training camp in Japan. “It all went very well, even though we had difficulties in the beginning,” he told fas.org.sg. “With lots of help, we managed to bring players out (for this trip). We were very happy with the training camp, where the players and coaching staff were very cooperative. The teamwork was there and the camaraderie was very good in this team. Even for some of the players who didn’t play in Mongolia, they played in Japan. “Everyone worked very hard for this tournament and we gave our all for our country. The boys gave their best… they sacrificed a lot. To finish second in the group without a defeat is something that has never happened in Singapore football at this age-group level. The U22s are due to arrive back home later today.